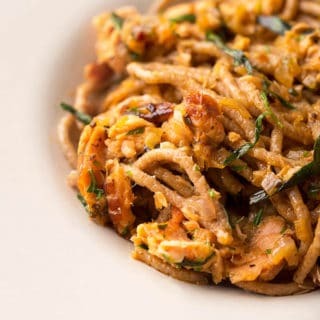 To really appreciate this recipe you should use whole wheat, spelt or other darker pasta, not standard semolina - but if that's all you can find, don't let it stop you from making this recipe. I prefer smoked salmon here, but any smoked fish will work, such as trout, mackerel or bluefish. Bring a large pot of water to a boil. Add enough salt to make the water taste quite salty, like seawater. Add the pasta. In a large saute or frying pan, heat the butter over medium heat and add the shallot. Saute the shallot, stirring often. You want it soft but not browned. Add the flaked salmon and spread it in one layer in the pan. Let this cook to sear a bit. Don't move the fish for at least a minute, maybe two. Pour in the wine and use a metal spatula to scrape up everything off the bottom of the pan. When most of the wine has boiled away, mix in the herbs and add fair bit of black pepper, maybe a couple teaspoons' worth; you want to taste black pepper in this dish. Turn the heat to low. To finish, move the pasta from the boiling water to the pan, and toss. I like to add maybe 1/4 cup of pasta cooking water to the mix to emulsify everything. Toss and serve at once.